Sunny Leone is ecstatic with the audience reaction to Raees' song Laila Main Laila in theaters. But Shah Rukh Khan has some advice for his fans. Shah Rukh Khan is extremely happy with the response of the audience on Raees. Well, that’s some advice coming from the producer of the film, in his true businessman spirit. Isn’t it. In a theatre of Kurnool, fans are going crazy over Shah Rukh Khan and Sunny Leone’s song “Laila Main Laila” from Raees. In the short video, we can see people dancing and throwing money on both the stars. While Shah Rukh has always been welcomed on screen with so much love, it is a new experience for Sunny. 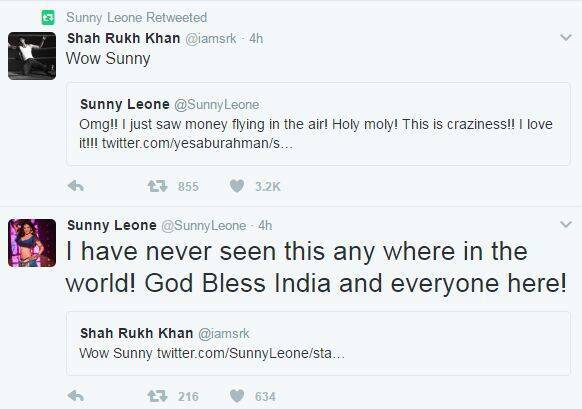 The actor retweeted the video posted by Shah Rukh fan and expressed her joy over it. Earlier, the actor was moved by the kind of adulation SRK has. She experienced some lifetime moments when she was on the train with team Raees, from Mumbai to Delhi. Watch | Sunny Leone calls Shah Rukh Khan a dedicated father.